When it comes to Robotics, iRobot are one to be highly reckoned with; iRobot focus their research, development and energy on 100% robotics and that has taken them to various markets from Enterprise to home to defence and security. 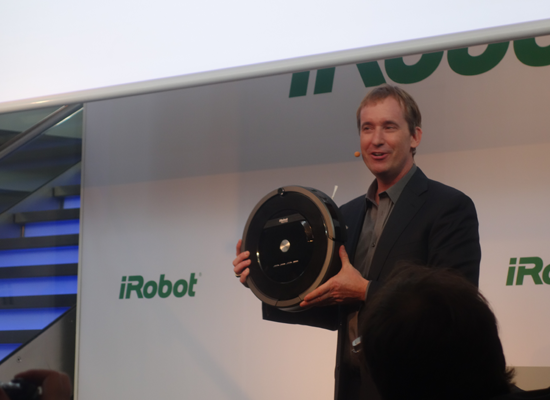 iRobot’s CEO Colin Angle and his team yesterday visited Munich with a showcase of some of the latest technology introduced in those industries but with main focus on the home sector with the new Roomba 800 series and Scooba 450 series. 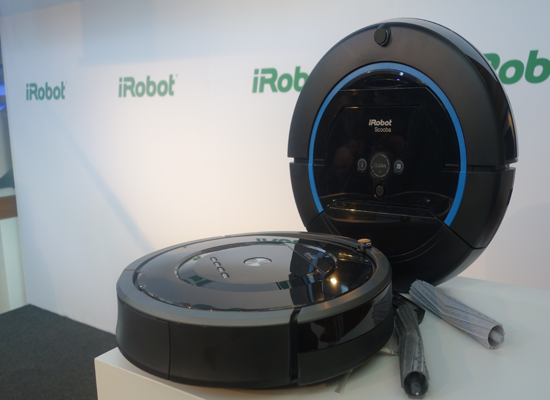 In the past vacuum cleaners used bristle brushes and that can be a challenge for users with the need to keep them maintained by having to replace it when it stops turning having turned over with human hair or pet hair; to keep innovating, iRobot introduced their new AeroForce Extractors that are designed to amplify suction. 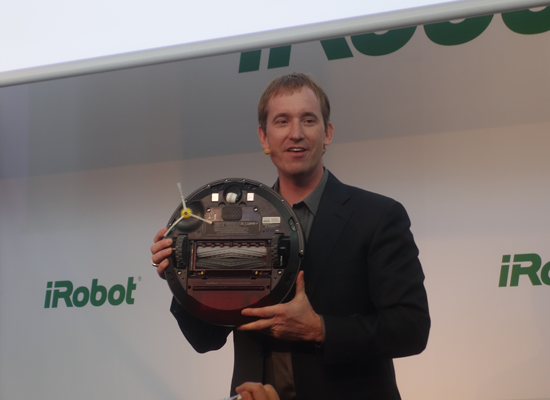 The new tech also allowed iRobot to increase the Roomba capacity by 60%, which just means as a user, you will spend less time emptying out the dirt collected; its all great step towards iRobot’s plan for robotic vacuum cleaners that doesn’t need to be touched in order to perform their tasks. 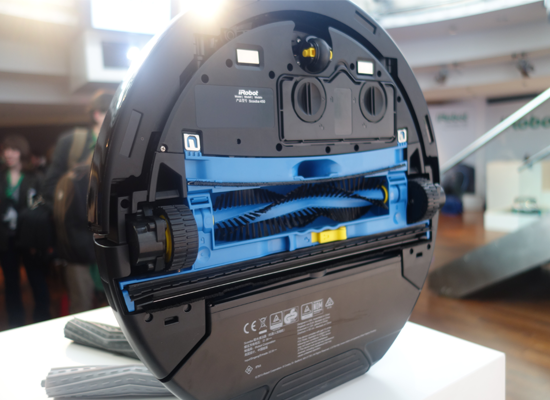 The new technology is seen in the Roomba series and it breaks down the debris meaning no more tangled hair or breaking brushes; that is good news for users as it means zero maintenance is needed thus saving money over time. Speaking to the Marc Dinee, Vice President of sales and Marketing , he assures us that the new AeroForce mechanisms are also made from TPU material and makes them very friendly to any surfaces that could face it. What was also impressive is that its energy consumption and battery life has also improved drastically which is again good news for potential users. The new Scooba was also impressive when it comes to innovation; iRobot didn’t just upgrade the features and make it all singing and dancing, what they did here is make the Scooba more hygienic especially in the kitchen environment; currently when users mop their floors, they are very likely to get the same dirty water recycled in the process of mopping the floor, but with the new way the Scooba works, it keeps the dirty water separate from the clean water and better yet, in order to save time spent keeping it clean, the Scooba is now intelligent with the way it self cleans. 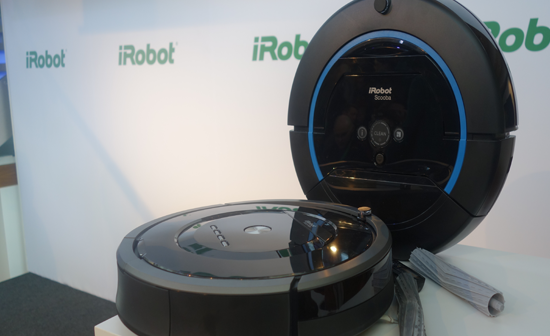 iRobot claims the new Scooba is three times more effective at clearing dirty floors than the last model; it is more intelligent with better mapping algorithms, backwards compatible with previous virtual walls and now comes with new Dry Dock charging and drying station that holds the Scooba 450 vertically; with that position it allows it to dries out the interior by running air through it. We also had hands on with on of their defence robots, the iRobot FirstLook aimed to be a robot used by the military to send to dangerous zones to have the first look at the environment before humans step on the area thereby keep them safe. They also showed us the Ava 500 enterprise teleconferencing robot which allows users to set up their robots at different office locations, map out the location and give them access to be present at those locations with full control remotely; it now means that businesses who can afford it can view their remote factories for example without been present and interact with people current at the location. All the products announced in Munich are making their debut across Europe for the first time yesterday, and it was great to have hands on with products and gain insight into how they are using their skills in robotics to enhance human lives around the world. The new Roomba and Scooba are expensive but don’t forget iRobot also provides variety of cleaning products to cater for different price points.